It seemed like this day would never arrive. As one of my goals for the year I committed to writing a book For a long time I wasn’t sure if I’d make it, but I’m happy to announce the book is finished and available now. The day did arrive. The title of the book is “Design Fundamentals: Elements, Attributes, & Principles” and if you’re wanting to get right to the book and purchase it, thank you and click here. If you’d like to hear a little bit about how the book came to be, what it’s about, and some behind the scenes changes I made to the site, read on. And then click the link above or at the bottom of this post to buy the book. Did I Really Finish a Book? The idea for Design Fundamentals began sometime in 2012 and my original plan called for finishing the book last year. I never did make time for it other than a couple of weeks last fall where I worked out the general outline and made a few quick notes on what the book would be about. This year I put it at the top of my to do list and started working on it just after New Year’s. I decided to follow my blogging process, since it’s, in part, designed as an easy way to fill up blank pages. Here’s a month by month breakdown. June — Worked out how to format the book for .pdf, .epub, and .mobi files and continued to edit. My goal was to have the book ready by the end of April, but here I was 2 months late when it dawned on me how much work I’d need to do on the site to be able to sell the thing. That’s what I’ve been working on all summer long (and a few weeks of fall) in between projects for clients. I did a little more than just set up a way to sell the book, but I’ll get back to the additional changes in a bit. When I began in business I had a partner, a friend of mine who would handle the visuals, while I handled the code. Our business didn’t do so well and she went on to do other things. I wanted to continue and was struck with the realization that I’d have to design as well as develop. It was a scary thought and I’ve spent a few years teaching myself whatever I could about design. There wasn’t a lot of information online when I started. Some information was online, but hardly a lot. I turned to reading as many books as I could get my hands on and tried to put together a course of study for myself. I figured there were others in a similar situation who perhaps didn’t have access to the books I found and struggled to find anything online. I started writing here about what I was learning in the hopes of reaching some of you. However, that information isn’t necessarily easy to find even when limited to searching here. It’s not presented in the best order for learning. Older articles needed updating. Missing pieces needed to be added to tie some things together. Writing Design Fundamentals gave me an opportunity to correct these flaws. Before I get to what’s inside, there are a few details about the book I’d like to share. First, it’s an ebook only. There’s no print edition and I don’t plan on there ever being one. The book is available in .epub, .mobi, and .pdf formats so whatever device you use for reading you should have a file that works. You’ll get all 3 files in a zip when you order. One reason for ebook only is the ability to update the book. It always bugged me when I’d buy the 3rd version of some technical book only to see version 4 in the store a few months later. I’d feel a bit cheated, though I certainly understood that the publisher had costs in printing a new edition and couldn’t just give it to me. That’s not the case with an ebook. There are costs in updating an ebook, of course, but not in printing copies. Updates to the book will always be free. I don’t know how often I’ll release an update, but I do plan on improving the book over the next few years. At first it will be to correct typos and other minor things. Later I’ll refine some sections, write new ones, and who knows what else. When you purchase the book you’ll be asked to create an account. You’ll be able to login and download the book as often as you like. I’ll also ask you to subscribe to an email list which is how I’ll let you know when a new version is available. The title pretty much says it all. 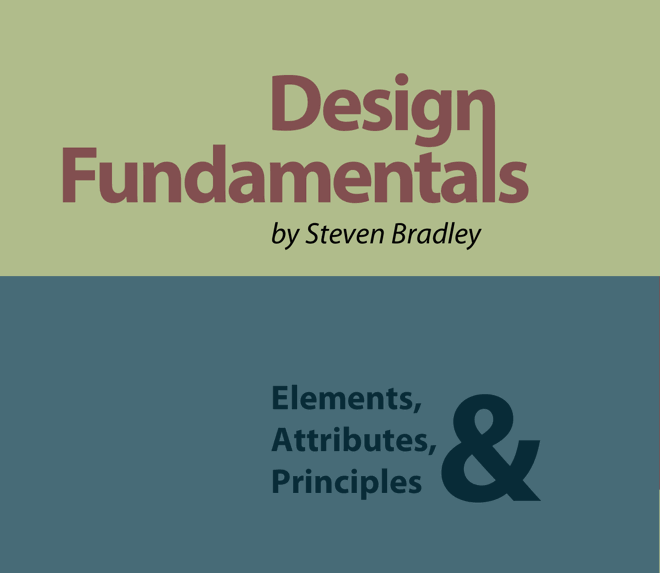 Design Fundamentals: Elements, Attributes, & Principles is about the fundamentals of design and it contains 4 chapters. Those 4 chapters come close to filling 250 pages and at the end I present a reading list of books I recommend along with many articles online. It’s my hope that after reading you’ll have the tools necessary to compose a design that attracts and keeps visitor attention to ensure they hear your message and take the action you want. I mentioned working on the site all summer. Naturally to sell the book I needed some kind of shopping cart. I decided to go with Pippin Williamson’s Easy Digital Downloads and I’ve been vey happy with it. However, I added a couple of things beyond a shopping cart. I wanted to do more than just sell you a book. I wanted to be able to talk with you about it and let you talk with each other about it and let all of us talk with each about design and development in general. To help build community on the site, I’ve added a bbPress forum with extended BuddyPress profiles. For now the only way to get to either is to buy the book, but down the road I’ll open the extra Press’ to everyone. It’s my hope that you’ll share thoughts about the book and how I might improve it. I’m hoping you’ll help me shape future editions. When buying the book you’ll create a login and you’ll gain access to the new additions. I’m going to keep the list of sections smaller at first to give me a chance to let the community grow and show me where it would like to go. That’s the story of how this book came to be, what it’s about, and how this site is evolving. It took longer to get here than I expected, but here it did get. Naturally I hope you’ll buy the book, enjoy it, learn from it, and help me shape future versions of it. Thank you in advance if you do. If all you ever do is read the blog, thank you as well. It always amazes me that anyone is interested in the things I have to say and I appreciate everyone who leaves a comment, sends me a nice email, or simply reads what I’ve written. Once again you can buy the book now. Just click here. I hope to chat with you on the forums inside. Be useful to see a sample chapter, or part of. Not a bad idea. Give me a few days and I’ll see what I can come up with. I would think if you generally like what’s here on the blog you’ll like the book, but I can see where a sample chapter could be helpful. Would you prefer the introduction or one of the sections on a more specific topic? You choose. The idea is to show people who may or may not be your blog readers the type and quality of the information in the book. Either way, I’ll be buying – I find your writing to be very interesting and clear. Thanks Steve. I agree about showing people who aren’t usually readers here. I looked through the book yesterday and started thinking about a few sections and which would read best on its own. I haven’t done anything to promote the book yet other than posting about it here so for the moment it should only be people reading here who know about it, but I agree it makes sense to offer a sample chapter. Thanks for the compliments on my writing. Always nice to hear. Does your book look into the psychology of shapes, textures, colors and their alignment to psychographic profiles, e.g., blacks and dark greys are preferred as luxury car colors? Thanks. It does, though I can’t guarantee it’ll include exactly what you’re hoping it will. I do offer some information about color meaning and the sections about lines, shapes, etc., include information about what a horizontal line communicates as opposed to what a vertical line communicates. Is that the kind of stuff you’re looking for? It’s not written as black and grey appeals to luxury car buyers. It’s more black is seen as formal and elegant and gray is seen as mature and dependable.